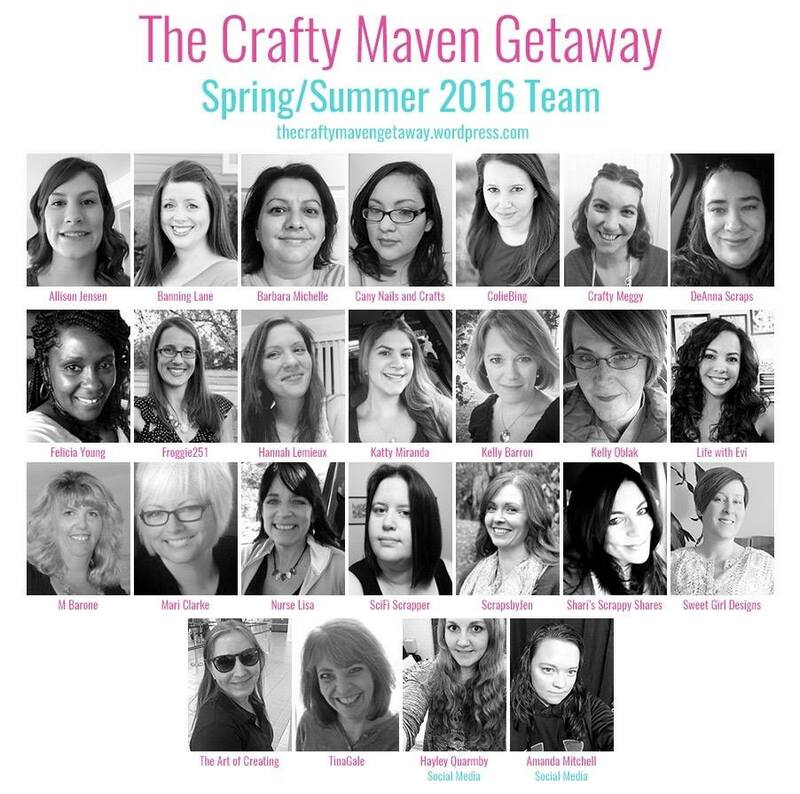 I’m excited to be a design member for The Crafty Mavens Getaway spring/summer 2016 team! 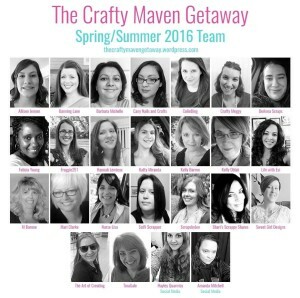 The Crafty Mavens Getaway are a fantastic facebook group in addition to a youtube channel with daily posts where each day has it’s own unique theme. They also have a blog at https://thecraftymavengetaway.wordpress.com/ and a podcast. I’m looking forward to working with all these wonderful ladies. No trip to the St. Louis Zoo would be complete with out a picture with the Phil the Gorilla statue. Below is a scrapbook page using a picture from several years ago of my daughters, Emma and McKayla, standing by Phil the Gorilla’s statue. I started the layout by choosing a pink and peach triangle pattern paper from Citrus Twist, but ended up changing it out for a floral pattern paper from the Amy Tangerine Stitched paper pad. I also used a black and white leaf pattern paper and two other yellow pattern papers from the Amy Tangerine Stitched paper pad. I added a pink, an orange and a green pattern paper from a 6″x 6″ Colorbok paper pad. I inked all the edges of the papers and added embellishments from my January 2016 Citrus Twist main kit. I also used a few chipboard stickers by Amy Tangerine and some black enamel dots. I love how this page came together! Below is a process video for the page. 20 pages in five 15 minute sessions is concept behind Journaling by 5’s. I was introduced to this process by watching Adele Toomey on her Youtube channel Let’s Get Inkie. In her video Adele credits Shannon Green as the inspiration behind Journaling by 5’s and I’ve linked to both of their videos in the description portion of my Youtube video which is below. when you’ve completed all 5 sessions you can go back and repeat any if you want. 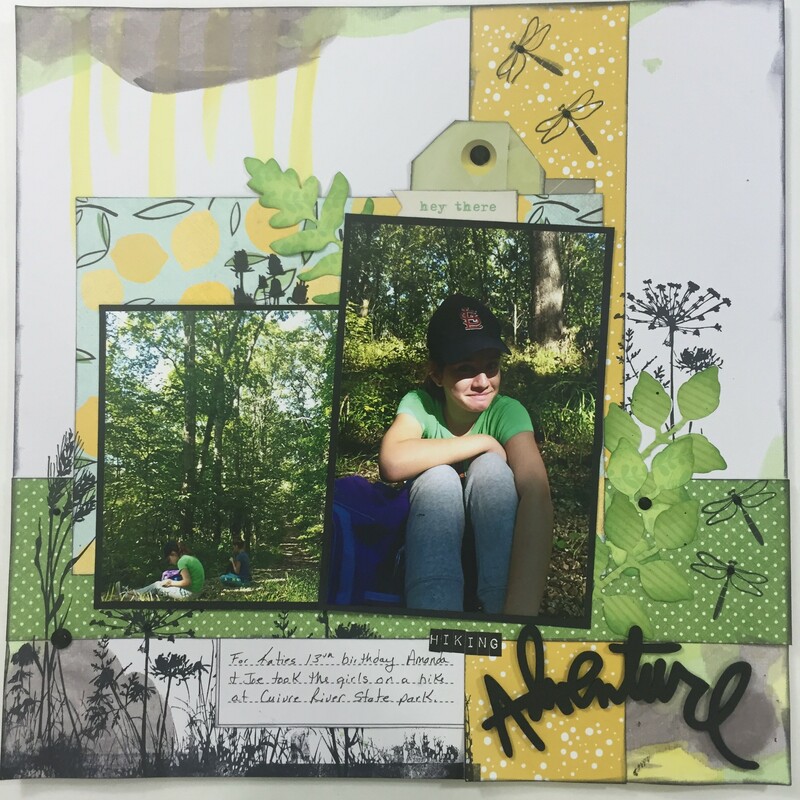 In Shannon Green’s video she uses a composition notebook with some of the pages glued together leaving her with 20 thicker pages to work on. Adele Toomey used 20 separate sheets of paper which is what I chose to do as well. My pages were made using paper from a mixed media paper pad that I cut down in size to fit into my art journal binder. My favorite step was the first step and I also enjoyed step three very much. Steps two and four were my least favorite steps, but over all I loved this whole project. The time limit and having a next step made me keep going when some the pages were looking bad after each of the first three steps, but the fourth and fifth step pulled them all together, and in the end the pages turned out great. A big thank you to Shannon Green and Adele Toomey for sharing this wonderful art journaling process! I received my first kit club kit! After watching many of my favorite youtubers using kits on their layouts I began checking into some. I received a few extra things for being a new customer. Below is a video of what came in the kit along with the few extra thing they sent me for being a new customer. I can’t wait to make some layouts with all theses goodies! I’ve only started scrapbooking this past year so I have a lot of older pictures waiting for me to make pages with. McKayla is 11 now, but I loved making a layout with this picture of her from when she was a baby. Her chubby cheeks are gone now, but she still has that cute dimple. For the patterned paper is used a Dear Lizzy Lucky Charm paper pad by American Crafts. I matted the photo on black card stock. 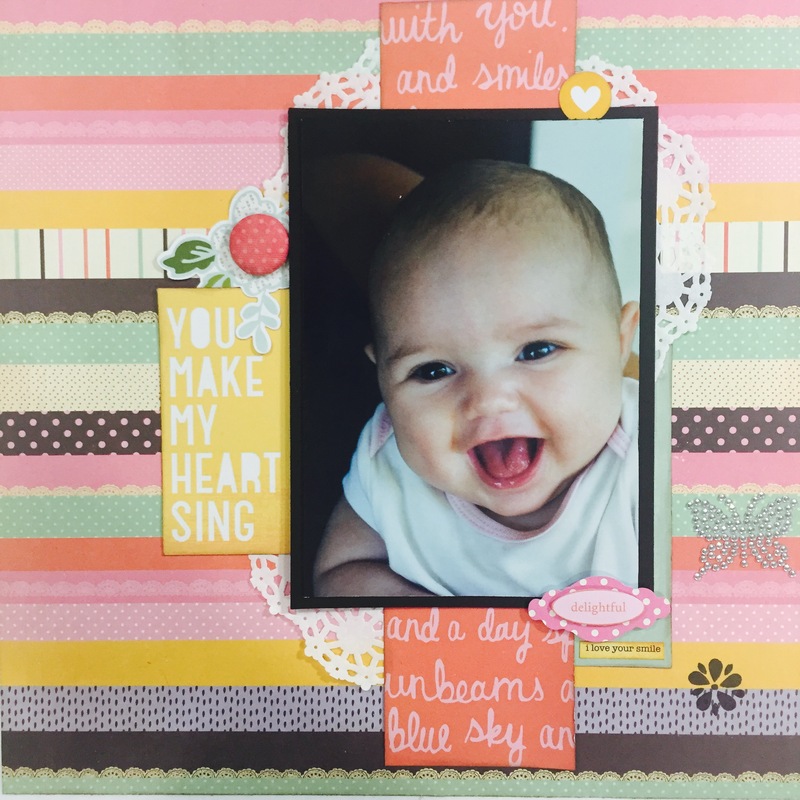 I added doilies behind the red and pink script patterned paper strip and the photo. Around the picture I placed a flower die cut, a yellow circle with a heart in the middle and a sparkley butterfly sticker. I loved using pieces from my Citrus Twist January 2016 main kit, watercolors and stamps on this layout. The watercolor was inspired by a Crafty Maven Getaway inspiration piece linked below. 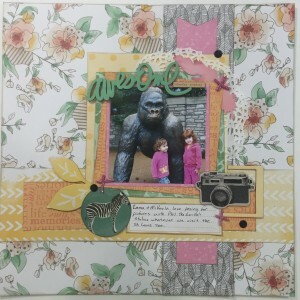 The photos on this layout are from hiking trip at Cuivre River State Part. My sister and her husband took my girls and their daughter Katie on this hike as a part of Katie’s birthday weekend. Most of he paper for this page came from my January Citrus twist kit, but I did use some scraps to die cut the leaves. I used my StampeRor to stamp the wild flowers and dragon flies. I added dragon flies and some black gems to the page after I finished filming, but you can see the rest of the processes in the video below.